Petco Park, home of the San Diego Padres, is located in the heart of downtown San Diego. The ballpark opened in 2004, and is the successor of the former ballpark, Qualcomm Stadium. Before 2004, the San Diego Padres shared Qualcomm Stadium with the National Football League (NFL) San Diego Chargers. 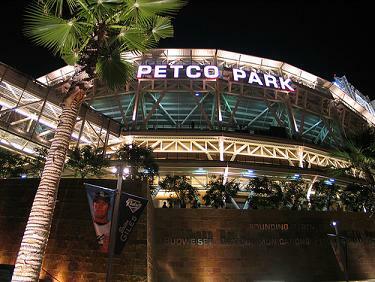 The ballpark gets its name from the pet and animal supply company, Petco, based in San Diego, California. Petco paid the naming rights for the ballpark. The Padres' home park is located south of J Street between 7th avenue and 10th avenue. San Diego trolleys are on the southern part of the ballpark and the trolley tracks go along the northern part of Harbor Drive, right beside the San Diego Convention Center. The main entrance of the ballpark is behind home plate and is located south of 10th avenue and Imperial, facing a San Diego trolley terminal. K Street is a promenade for pedestrians located at the left field and center field for easier access to a park. San Diego Ballpark Builders in partnership with Nielsen Dillingham, Clark Construction, and Douglas E. Barnhart constructed Petco. San Diego Redevelopment Agency and the Center City Development Corporation funded the full $450 million to build Petco Park. Originally Petco was part of the rejuvenation plan of the East Village area in downtown San Diego. The Padres' home is located between Harbor Drive and the San Diego Convention Center. The main entrance of Petco Park is behind the home plate and is located approximately two blocks away from the San Diego Trolley terminal. The San Diego Padres hoped to play in their new ballpark for the season opener in 2002. However, they postponed construction for political and legal reasons. The legal reasons were the result of a court decision that nullified a ballot that expired, which approved the City of San Diego's part of the funding of the ballpark. A second delay was the result of the declaration of the Western Metal Supply Company building as a historical site. However, later the Court ruled that the Western Metal Supply Company building's "landmark status" only applied to its exterior. 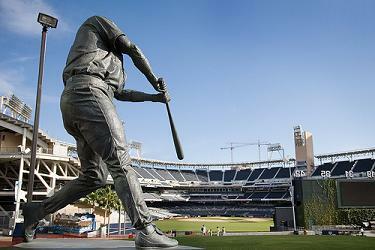 Consequently, the San Diego Padres played at Qualcomm Stadium for the 2002-2003 baseball season. The red bricks and blue seating make Petco different than other Major League Baseball ballparks. The Padres coated the ballpark in white Indian sandstone and painted the 42,445 fixed seats dark blue. The purpose of the colors is to mimic San Diego beaches and cliffs such as the blues of the ocean water and the nearby boats white sails. 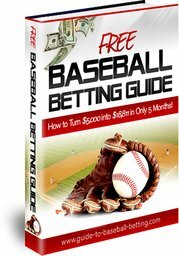 In addition to the colors and designs, the batters face north instead of northeast as in other major league ballparks. This allows the fans to view the San Diego skyline, the San Diego Zoo, and the San Diego Bay. The architects of this ballpark, Antoine Predock and HOK Sport, designed Petco so that the restaurants and other ballpark amenities surround the park instead of being inside the park. The ballpark's concession stands are open to the visitors on game day and to outsiders wanting to purchase items from the ballpark. 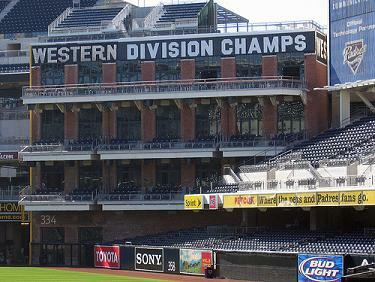 In 2006, a local newspaper publication, the San Diego Union Tribune, presented Petco Park with an Orchid Award for best design.